President Obama announced the Clean Power Plan yesterday, citing the need to reduce pollution from power plants as an essential part of the climate change debate. The Clean Power Plan will focus on reducing carbon emissions from power plants because they emit more carbon than any other sector in the country. Even the U.S. Military recognized that climate change poses a major threat to both national and global security. Critics argue that the Plan is unfair, punishing taxpayers and destroying our economy. But, like other similar initiatives (the Clean Air Act, the Clean Water Act, the Endangered Species Act) the social and long-term economic benefits will outweigh the additional burden on the economy. The main benefit is cleaner, healthier air for Americans. The plan aims to reduce sulfur dioxide emissions 90% from 2005 levels by 2030, while nitrogen oxides would be 72% lower. These decreases would in turn lead to a dramatic decrease of airborne coal particles. Because these are the main culprits of smog, low levels will mean avoiding thousands of premature deaths and asthma attacks. This plan arrives at the right time; half of existing United States will be outdated by 2030; it’s simply replacing the coal with renewable energies. We’ve been implementing such replacements over the last decade, which has resulted in our decrease in carbon emissions. South Carolina and Kansas are among the states that have proven that environmental mindfulness can be practiced while still being economically prosperous. The coal producers will foreseeably have an issue with the Clean Power Plan. Worldwide coal use is still growing, so many coal producers will focus operations internationally, similar to the tobacco industry. (Over the last decade, the U.S. smoking market has declined, while China’s has boomed). The Plan sets a goal of 32% reduction in power plant emissions by 2030 relative to 2005 levels, but each state will choose how to fulfill the goal. This Plan won’t damage the economy or our energy reliability. Furthermore, jobs won’t be lost, but shifted due to changing demands in the energy sector. It will call for new innovations in alternative energy, including the historically underutilized nuclear. It will lower our health care costs. It will also cause a mountain of legislation trying to derail and delay it. The largest application to real estate lies in the reuse (redevelopment or repositioning) of existing coal plants. This increased (obliged) demand for facilities that support new and renewable energies will lead to partnerships between such energy companies and real estate developers/investment companies to create these highly specialized power plants. The housing market in such areas will not change much, unless an entirely new facility (in a new area) is being built. If the older coal plants are simply turned into renewable energy plants (with much of the jobs simply being shifted), theoretically the amount of people in the area should stay somewhat the same, which means the demand for housing will be virtually unchanged. Finally, land investment (property without an existing structure) will increase; as wind farms become more prevalent (like Spain, which announced in 2012 that 64% of its electricity demand came from wind power), the cheapest development option is vacant land. This is obvious; it is cheaper to simply build upon open land than tear down an existing, useless structure. In the coming five to ten years, it will be interesting to see the changes in all industries (real estate included) due to the worldwide efforts in climate change. 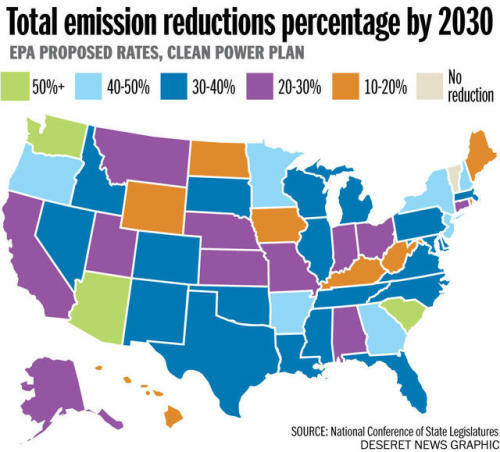 A map of the proposed emissions changes outlined in the EPA’s Clean Power Plan, for 2012-2030. Lower reduction rates signify one of two things: that the state has already taken measurable actions on climate change, and that there isn’t much relative room to shrink (Vermont), or the state does not contribute much to carbon emissions and therefore has no place to reduce (Hawaii). High reduction rates signify that these states are highly likely to already be taking actions to remedy climate change NOT related to the reduction of power-plant specific emissions; these reductions will substantially add to their already existing efforts.